On April 9th, 2016, EWB hosted Professor Christopher Swan, ScD., P.E., Professor Jennifer Coates, Ph.D., Joshua Das, MPH, Natasha Wright, and Sarah Freeman for our 10+ year anniversary event in Cabot Asean Auditorium. The night focused on clean water projects both domestically and internationally, with each speaker offering their own unique experiences and perspectives. The speeches were interesting, relevant, and enjoyed by all, including the many non-EWB members who attended the event. Fred Berger, one of our largest donors who passed away recently, was honored during Sarah Freeman’s speech where she discussed his impact on her pursuit of a career in international development. Jennifer Coates proposed that the engineering design process may provide a better framework for international development work than current practices. Her husband, Joshua Das, an engineer who manages Boston’s clean water, discussed how important engineering can occur domestically as well as abroad, citing the Lead crisis in Flint, Michigan as an instance where engineering could make a large impact on the daily wellbeing of people. Natasha Wright, a current doctoral candidate at MIT, spoke about her new design of a water filtration system using reverse osmosis. She has been working with a team at MIT to develop their design and market it to a wide audience in rural India. 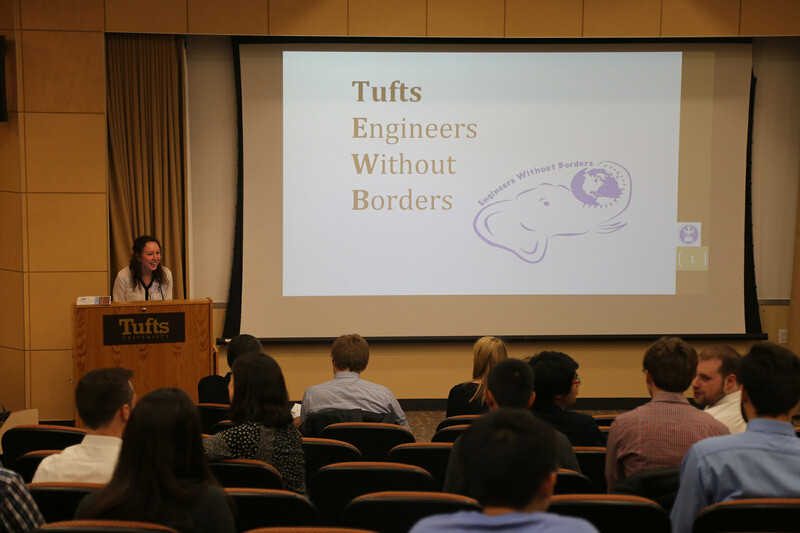 The night was a huge success, with alumni representation from many of the projects we have done in the past, including the founding members and first travel team for Tufts EWB. It was inspiring to current EWB members to hear about the future of international development work from past members of EWB. Everyone came together to celebrate the past and future of Engineers Without Borders.